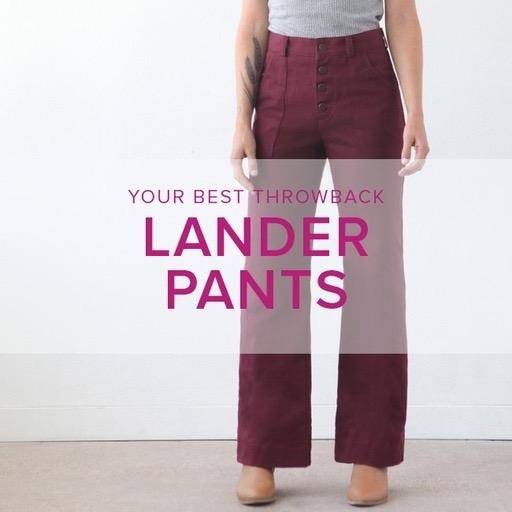 Description: With a high waist and button fly, the Lander pattern is not only on trend, but also flattering and comfortable for all body types. The pattern includes front and back patch pockets, belt loops, and a straight fit through the legs. View A is a short with a 4” inseam, View B is an ankle length pant, and View C is a boot length pant that can be worn with a heel. This class will require homework between sessions. Class prerequisite requires at least Advanced Beginner level sewing experience, including experience sewing from a pattern. Previous experience sewing pants is not necessary. Fabric required for size and style desired, pre-washed. For main fabric, recommend medium to heavy bottomweight fabrics with little to no stretch, such as twill, linen, corduroy and denim. For pocket lining fabric, you will need 1/2 yd of light to medium weight woven fabric. Appropriate fabrics include rayon bemberg, cotton voile, quilting cotton, linen, or standard lining fabrics. BEFORE YOUR FIRST CLASS: Please come to your first class with your fabric pre-washed and your pattern pieces traced. If you need help figuring out what size or sizes to trace, or how to grade between sizes, email erica@moderndomesticpdx.com about connecting prior to class to get your questions answered. We will check your measurements in class and adjust your traced pieces if needed. Please bring your original pattern and tracing paper to the first session in case we need to make adjustments to your traced pieces. Once we have looked over your traced pieces we will cut fabric together during class. In the first session of class, we will re-measure you and confirm that the size/sizes you traced were indeed correct and make pattern adjustments as necessary. I will have you baste your traced pieces together in order to do a paper fitting in class. You will need to wear or bring leggings, spandex pants, or dark tights to the first session (something snug you would feel comfortable having others see you in without another garment over it. I will be happy to step into the restroom with you for privacy's sake if you don't want to do the fitting portion in view of the rest of the class. After we have completed the paper fitting we will cut fabric together in class. Please do not cut your fabric prior to class in case we need to adjust your pattern. What is an “Intermediate” level class at Modern Domestic?